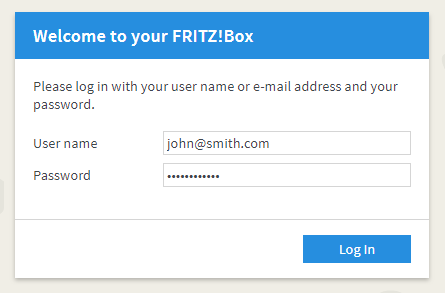 In the "Enter email address" field, enter the email address you used when registering your MyFRITZ! account. This is the email address displayed under "Internet > MyFRITZ!" or "Internet > MyFRITZ! Account" in the FRITZ!Box user interface. Note:You can edit the access rights for FRITZ!Box users under "System > FRITZ!Box Users" or "System > FRITZ!Box Password" in the user interface.